I get quite a few questions about skin problems like eczema and psoriasis. 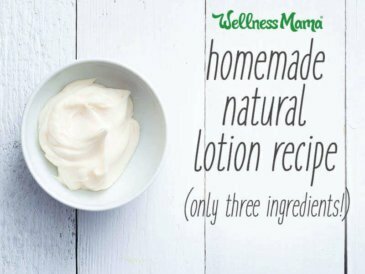 I’m not a dermatologist by any means, but I have had some personal experience with eczema (in myself and family) and have found some natural remedies that are helpful so I wanted to share. I feel it is important to note that all of the topical remedies in the world didn’t help us until we addressed the underlying problem, specifically: diet and lifestyle factors that were causing/contributing to the eczema to begin with. Certainly, eczema and other skin issues are complex conditions with a potential variety of causes, but there do seem to be some common things that help (both dietary and other). In our family, our son struggled with eczema off and on for a long time before we were finally able to get rid of it. He was born via c-section (due to placenta previa) and was given antibiotics and steroids as soon as he was born. This led to problems with his gut bacteria, some learning delays and some skin/digestive problems. We started the GAPS program combined with a pretty intensive supplement and lifestyle change for him and finally started to see improvement. For us, it meant a diet high in healing foods like bone broth (great for skin) and healthy fats and removing certain foods including gluten and casein (wheat and dairy). We also found that it was helpful to avoid food dyes and any processed ingredients, though this was as much from a behavior perspective as a skin one. If you or a family member struggle with skin problems, allergies or behavior struggles, I’d definitely recommend at least checking out the book Gut and Psychology Syndrome to see if the protocol would be helpful for you. Eczema isn’t a problem just because it causes pain and itching. In babies, it can be a risk factor for other problems. I didn’t realize this when we were figuring out my son’s issues, but according to newer research babies with eczema have a 1 in 3 chance of developing a food allergy later in life. Moreover, research shows infants with eczema being 11 times more likely to develop a peanut allergy by their first birthday compared to infants without eczema. Infants with mild to moderate eczema: Consult with your pediatrician about what “mild to moderate” eczema means and what level of screening is required for your child. If your child has mild to moderate eczema, early allergen introduction is recommended to help reduce their risk of developing food allergies. Infants with severe eczema: A discussion with your pediatrician or allergist is recommended before starting early allergen introduction. Your physician may recommend allergy testing prior to introducing any allergens. Early allergen introduction can be a tricky process for parents, especially for infants that are not yet ready to eat solid foods. Thankfully, there are companies creating solutions like this non-GMO organic supplement that you can mix into baby’s breastmilk, formula, or food to give baby the right levels of exposure and reduce the risk of future food allergies. I use coconut oil for everything. It is one of the things that would absolutely be on my list in a you-are-going-to-an-island-and-can-only-bring-five-things type situation. We use it for skin, hair, teeth, health and even soap making at our house, but it is also great for eczema (as long as the person isn’t allergic/intolerant to coconut!). I’ve found that for us, a thin layer of coconut oil or a coconut oil lotion bar helps cool eczema itching and pain. For those sensitive to coconut oil, these hypoallergenic lotion bars work really well too. For eczema that is wet/oozing, I’ve found that drying it works better than trying to moisturize it and offers relief. For this, we use a homemade salt and magnesium spray. I’ve often heard people with skin problems say that they felt better at the beach, and it makes sense. Between the Vitamin D, the magnesium and the minerals in the water, the beach is great for skin health! For those who don’t live near the ocean, this homemade spray can help achieve some of the same benefits at home. Fermented Cod Liver Oil (FCLO) is recommended by the Weston A. Price Foundation and is a great source of healthy fats for the body. This supplement is also an integral part of the tooth remineralization process as detailed by Dr. Price and by Rami Nagel in Cure Tooth Decay. These two help reduce inflammation in the body and lead to healthy cell, hormone and brain development. They are especially important during pregnancy and for children while their brains are developing. We take Fermented Cod Liver Oil in Capsules or Fermented Cod Liver Oil/High Vitamin Butter Oil blend in Gel Form. For some people with eczema, soaking in water makes it worse. For those who tolerate it, magnesium baths and other types of detox baths can be helpful in skin healing. I regularly add a cup of epsom salts or magnesium flakes and a few tablespoons of Himalayan salt to my kids baths. When I have the time, I take relaxing baths in this mixture also. When I can’t take the time for a bath, magnesium oil also helps. Amazingly, I notice the benefits of transdermal magnesium (baths or magnesium oil) much more quickly than when I take internal forms of magnesium. These three detox bath recipes are also all great if the person can handle warm water. Just as with the Fermented Cod Liver Oil, probiotics are one supplement that seems to make a noticeable difference with skin health (if the problem is diet/gut related). For us, high quality probiotics were vital when we were intensively doing GAPS. Probiotics and probiotic-rich foods are another element that is often missing from the modern diet. I’m constantly seeing more research on the many ways that gut bacteria influences our health. In the past, people often preserved food by fermenting it, which also was a good source of probiotics for them. Now, most foods are dead, and we rarely ferment them in the traditional ways, so we don’t consume probiotic rich foods without a specific effort to do so. We also make an effort to wash our hands and our food (a good thing with the chemicals on them these days) which also wash off the beneficial soil-borne micro-organisms that provide friendly-bacteria to the gut. We take Bio-Kult Probiotics (developed by the founder of the GAPS diet… it doesn’t have to be refrigerated) and I’ve seen digestive improvements from this brand (I’ve often see no result from other probiotics). We all take these as a daily maintenance, but at the first sign of digestive troubles or illness, we double or triple the dose until we are better. I also took these to heal after I got food poisoning, and was back to normal in a couple of days. I sneak them into the kids smoothies and drinks, and my older ones will even swallow or chew the capsule (they are small). I’ve mentioned that bone broth was an important part of a healing diet for us, and this was partially because of its high gelatin content. Gelatin is very soothing to the gut and is also great for hair, skin and nail health. In selecting the bones for broth, look for high quality bones from grass fed cattle or bison, pastured poultry or wild caught fish. Since you’ll be extracting the minerals and drinking them in concentrated form, you want to make sure that the animal was as healthy as possible. This recipe for broth is my favorite and is an adaption of the recipe in Nourishing Traditions. For those who aren’t ready to jump in to having a pot of boiling bones on the stove, some of the same benefits can be obtained from taking Gelatin as a supplement instead. We use Great Lakes Kosher since I was able to verify with the company that it is sourced from grass-fed, humanely raised cows, and as such is higher in nutrients. For scars or blisters from eczema that take longer to heal, a homemade healing salve was helpful for us. Our son would get eczema on his face before we were able to heal his gut and we are still working on reversing the scars from that. One thing that is helping is this homemade healing salve. 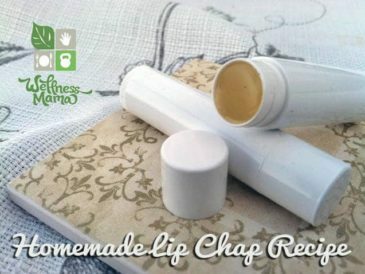 My homemade healing salve (or “boo-boo lotion”, according to the kids) is helpful on eczema as well as: cuts, bruises, stings, poison ivy and skin irritations. It also helps diaper rash and baby skin irritations- just don’t use with cloth diapers or line them first! I vividly remember how terrible it was to watch my son suffer through his eczema and I know the pain of not being able to take away the pain/itching a child experiences. 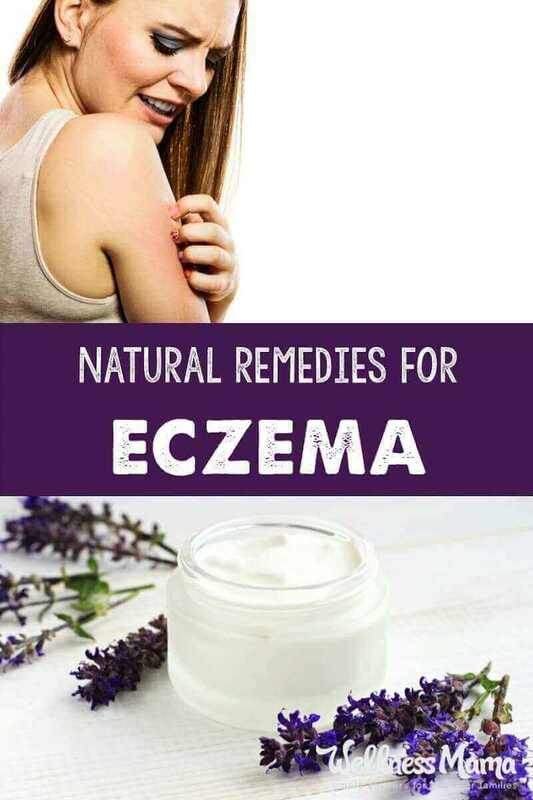 The book The Eczema Cure is a very thorough resource and provides answers when it feels like you’ve tried everything else. Use the code WMAMA20 at this link for 20% off. Have you ever struggled with eczema or skin problems? What helped you? Share below!